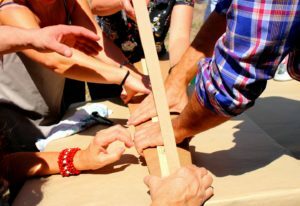 Then the course « Popharps in cardboard paper: from manufacturing to playing » is for you! Children cannot do the course by themselves, but they can accompany their parents for free. Disabled persons are welcomed during the course, there is no fee for the person accompanying them. You must be a member of the association to participate. To make our course accessible to everybody, we calculate our prices to the fairest. We are based in France, at Ivry-sur-Seine, near Paris, but we organise course in the whole of France and abroad.. 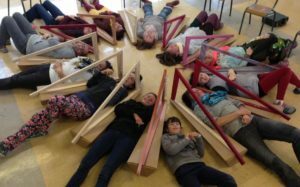 The Pop’harpe workshop (only for professionals) is happening once a year. Participation is free but reserved to members of the organisation. 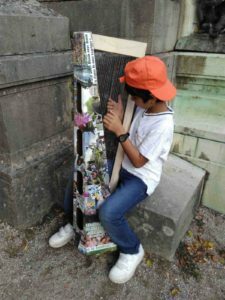 In 2017, Pop’harpe launched the « Humanitarian harpists » to help bring the harp where it couldn’t reach before. These projects bring harps and harpists where you don’t expect them. And of course, there are full of music, mutual aid and beautiful encounters! But, on top of everything, these projects are about the cultural exchange, the discovery of new practice and the human experience ! Since August 2017, we are taking part in the ATD Quart-Monde project, through the Festival des Savoirs et des Arts (Jura). In 2018 we launched a long term project to exchange with the Paraguay and the association Crear in Libertad which works around deprived areas of Asuncion. 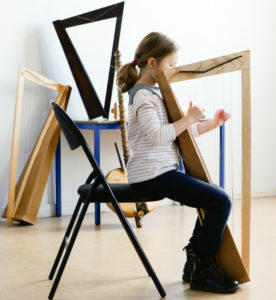 First of all, Pop’harpe is a pedagogical project. From manufacturing the instrument to playing it, what interests us is to give the keys and make music practice available to as many people as possible. 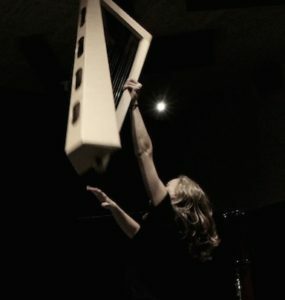 For example, on the cardboard paper harp, halftones, and more specifically sharps, are obtained with a technique from the 15th century, by shortening the string with a pressure of the nail. Another solution is to transcribe or improvise around the repertoire, like every musicians across the world are doing. For this purpose, we need to understand the language of the piece we are playing, its writing, not necessarily analysing it with scholarly methods, but feeling it. These methods have disappeared from conventional music teaching, especially in music schools, and though they are gradually coming back, they sometimes leave the teacher without the right tools. Playing on a cardboard paper harp gives us the opportunity to discover again these methods. We are always on a development and learning path so, step by step, we are creating a catalogue with specifically written pieces, technical methods, shared experiences… that will be soon be available. Many composers are working on the creation of pieces for cardboard paper harps’ ensembles. Among them: Hélène Breschand, Damien Charron, Sébastien Béranger, Alex Nante.